helping provide AMMI’s remote Bookkeeper with scans of receipts, documents, etc. Since hours of work will vary considerably based on Amber Mac activities, time tracking will be done through Freshbooks and trip tracking for vehicle use conducted through a mutually-agreeable software solution. There will be an initial 8-week probationary period for this position. A confidentiality agreement must also be signed. University degree or college diploma in digital marketing, public relations, communications, or similar training – We’re happy to do training in various areas, and see that as an important part of our job, but we also need someone who has some existing expertise in the areas we deal with every day. 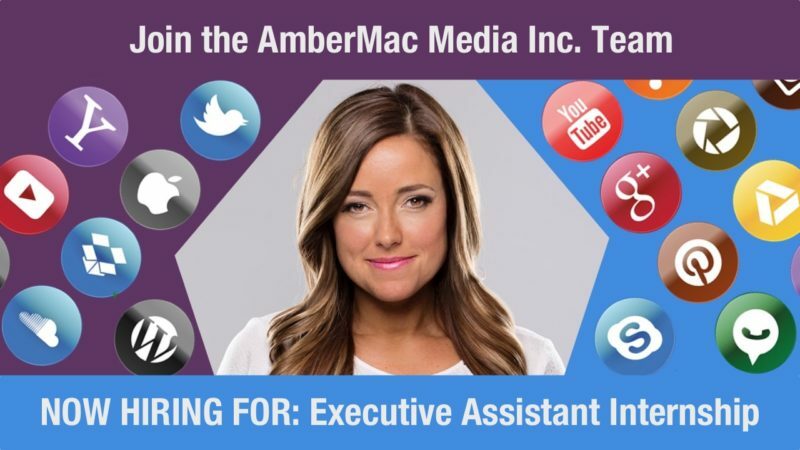 Professionalism – You’ll be representing AMMI and Amber Mac in various ways, and we need you to be well-spoken, well-dressed, on-message, and on-time. Excellent written communication skills – In addition to being well-spoken, you will need solid writing skills in this role, as you may be asked to proofread copy, write blogs posts, make social media posts, and more. Interest in photography – You’ll be taking a lot of photos in this role, and whether you have existing skills or you need some training from AMMI, it’s important that you are interested in capturing great images. Valid driver’s license – You’ll also need a valid driver’s license and to be comfortable driving an AMMI vehicle in downtown Toronto from time-to-time to do the occasional pick-up, drop off, or similar tasks. If you have access to your own vehicle that you can use for this work then please let us know in your submission. Located in Toronto area – While some parts of this job can be done remotely, there are many tasks that you’ll need to be directly on-hand to complete in Toronto, so only applicants in the GTA will qualify. Driving record check – For insurance requirements related to use of the AMMI vehicle. Please submit a (minimum 250-word) cover letter detailing why you think you’re a great fit for this position, along with an up-to-date resume with your experience, education, contact information, and other details outlining what you would bring to this role. Combine these two items into a single PDF file and email with the subject “AMMI Executive Assistant Internship Position” to jobs (at) ambermac (dot) com. We will invite successful applicants to proceed to the in-person interview via email on or before February 15, 2018.